Can Your Neck and Tongue Activity Improve Your lifts? Let’s start by clarifying that this article is nothing more than a summary of my thoughts based on personal observation, coaching, and discussions with clinicians and professors over the years. It is not summary of research or definitive fact, albeit from an anecdotal aspect I can consistently drive positive change when fine tuning based on the principles in this piece. Over the years I have observed a direct relationship between deep Neck flexors and quality of bracing and output of force production. This relationship can be affected by a number of variables and isn’t one simple variable. 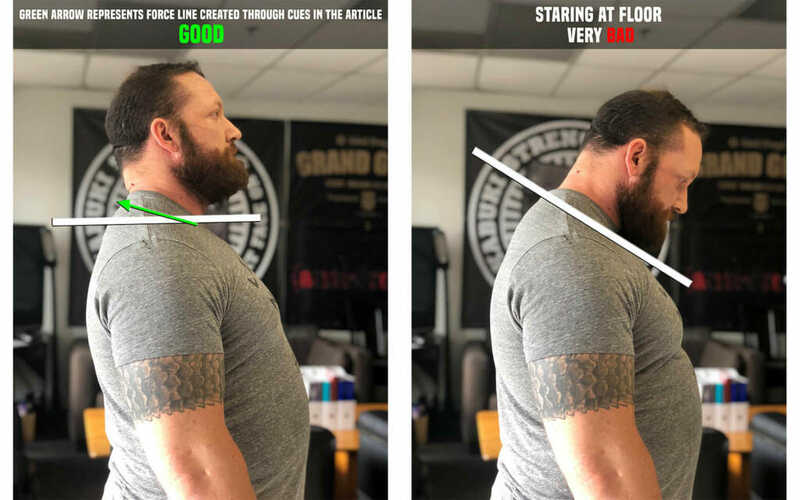 There is not one cue or position that will increase your force production or improve bracing quality, nor one sign that will let you know there is a potential problem or opportunity in addressing this area. However, there is a set of overarching principles I have developed that will make it easy to understand and manage. It may also explain why certain positions work for some people that don’t normally make sense, or some odd cues and even tools that we see are effective. What’s interesting to note is that at the embryotic state the deep neck flexors are attached to the diaphragm. Digesting that may help explain why issues in this area or the control of the spinal position at the thoracic outlet are tied so deeply to bracing (use of the diaphragm) and neural output. Many are aware of the ramifications of all the nerve outputs through the thoracic outlet, but what I’m diving into isn’t major dysfunction but more subtle changes. The areas that we are going to explore and fine tune to elicit change are around Over Active Deep Neck Flexors, Shoulder Position, Neutrality & Control of spine at the Cervical junction, and the use of the tongue. If an athlete has overactive SCM or Scalenes in the neck it needs addressed. A quick way to start that process is with soft tissue work or traction work with bands. These are quick ways to get these areas to start calming down but they do not address the root issue. Work with the athlete on reducing the amount of clenching and in particular crunching of the neck during lifting. The raised head bench press can be an area that starts this pattern for people particularly if its done in a very active manner. Having the athlete practice relaxing this area on their lighter sets is a great approach. Also look at how much they are elevating their collarbone actively while also observing the amount of engagement in these muscles as they do so. This can be seen in the deadlift a lot of times where the lifter is crunching their shoulders up at the top of the pull while also engaging these muscles hard. A slightly forward shoulder position may lead to the SCM or Scalene over-activity as well. We want to make sure the lats are engaging to control the scapular position during the movement keeping the shoulders centrated correctly. That forward shoulder position leads to excessive engagement of muscles trying to stabilize and hold the shoulder in position when its hanging out leveraged too far in front of the spine. I’m specifically looking at the neutrality of the base of the neck and not necessarily looking at neck packing. 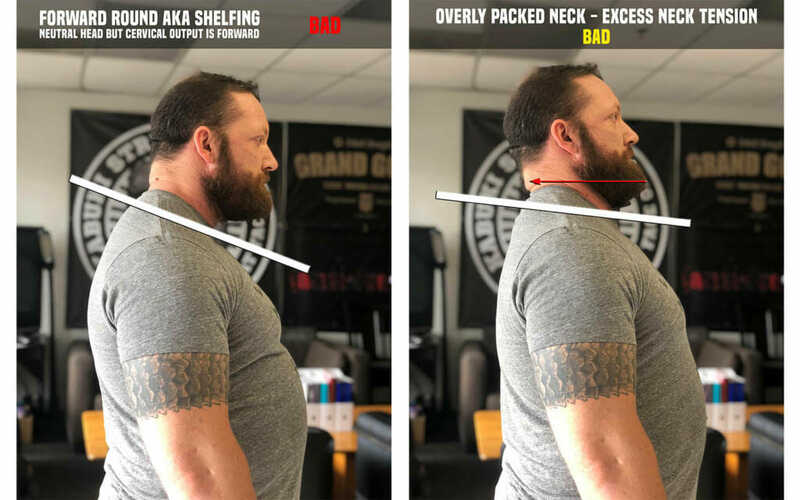 A good packed neck will deal with this issue, but I see so many people not understand this cue and the focus on the spine at the base of the skull or the chin position. This may or MAY NOT fix the position. 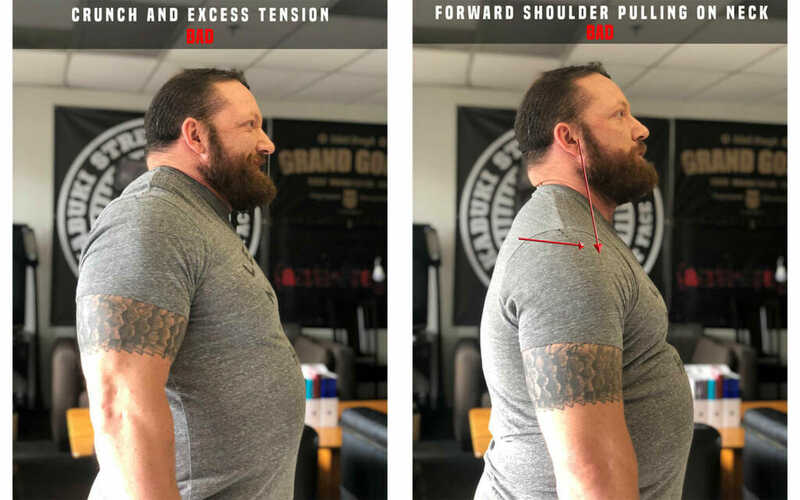 It is a really subtle push back at where the base of the collarbone is pushing back into where the bar would rest in the squat (relevant for all lifts not just squat) WITHOUT elevation of the rib cage. One cue we really like for addressing this is imagine wearing a heavy necklace with a medallion on it. Feel where the chain is resting low on the back of your neck and now use that point to raise the medallion on your chest without elevation of extension of the rib cage. This move is very subtle to be able to see the difference between before and after but has huge impact on force development. I mentioned the squat above as one area where we see the worst of this. People roll forward a bit creating almost a shelf for the bar doing the exact opposite of this. 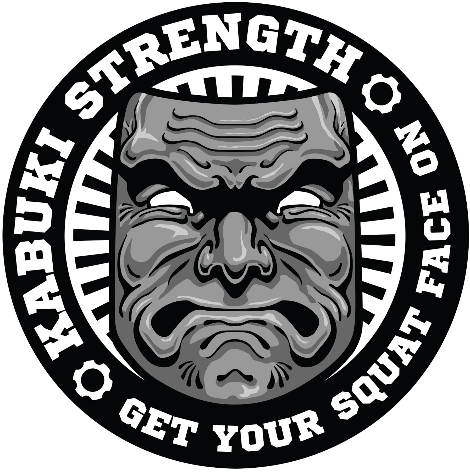 If the bar is sliding off your back then get a more course shirt, use chalk, or buy a bar with great knurling like the Kabuki Strength Squat or Power Bar 😊. We also see this with any lifter that is looking at the floor during the lift. Even in the setup like the walkout if you are looking at the floor it’s almost impossible to recover from this position once the system has been loaded. The deadlift is another area we see this particularly with people staring at the floor during the final phases of the lift. It may also help with understanding why the Russian style deadlift with the head way cranked way back at the end of the lift works. While I’m not a fan of this position myself I would much rather have someone do this than a head down style deadlift. If you look at this position it is clearly not a neutral spine with huge amount of extension in the cervical spine, but at the base of the cranium. But look at what it does to the positioning of the spine at the base of the cervical spine and the shoulder position. Both are exactly what I’m addressing. My argument is that you can achieve those same positions without driving the head way back once you know what you are looking for. Lets start this section with a piece of research showing improvement in muscular firing by 30% by placing the tongue at the top of the mouth. I know, I know, I promised no actual research in this article just my personal thoughts and experiences but this one happened to be readily at hand from a discussion I was having with a professor on the topic. I believe this all ties back and supports my theory around improved force production, i.e., CNS activity, from the relationship of tongue and deep neck flexors on the diaphragm. The Diaphragm is the driver of Intra-Abdominal Pressurization which is a controller of CNS activity throughout the entire body. I dive further into this topic in my article on ‘Traction Control’. What’s interesting in this discussion and allows me to dive a bit more back into Theory is mouth guards. Is the research on improved activity while using a mouth guard because it is having an impact on tongue and deep neck flexor activity? The relationship between Deep Neck Flexors, Tongue, Cervical Spine position at base of the junction, and the Diaphragm is all highly interdependent. It is important to understand the activity and positioning of each and the impact they can have on each other as well as the impact spinal and shoulder positioning have on all of them. Subtle changes that improve the system have an immediate and positive impact on CNS activity through observable changes in force production and power output. There is research on some of these individual areas supporting these concepts but as a whole much of what I have discussed is my own theories and observations as well as integration of feedback taken from clinicians and other coaches in their fields of work. As a whole these concepts can be put to place and tested in your own work understanding how they all work together. By understanding how these concepts work together will enable you to test and put them into practice with yourself and/or your athletes. Check out the BOWTIE by Spud Inc.